LAS VEGAS—The general population might best know Asus for its work on Google's Nexus 7 tablet, but hard-core tech enthusiasts know the Taiwanese company for all its inspired—some may say zany—reinterpretations of common computer designs. Next on the list of Asus flights of fancy: An all-in-one desktop/tablet combo that doesn't make you choose between Team Windows and Team Android. At first blush, the Transformer All-in-One P1801 looks like a relatively ordinary all-in-one PC, except for one clear distinction: The 18.4-inch display is mounted in a docking shelf. When you turn it on, this all-in-one's unique approach becomes more evident. The unit runs both Windows 8 and Android 4.1 Jelly Bean, an unusual dual-operating system combination; you can switch between the two OSes by tapping a button along the right edge of the tablet. The switch is seamless, and makes hopping between Windows and Android viable. 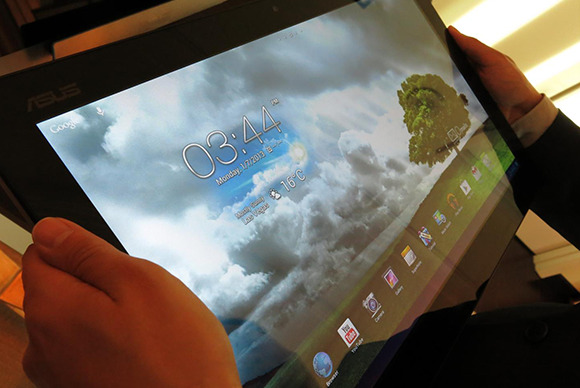 Previously, the largest Android tablet we've seen was Toshiba's Excite 13, at 13 inches. The Transformer All-in-One's split personality extends beyond its dual-OSes. It also has two processors, another unique find: The docking station contains an Intel Core i5 or i7 processor, while the tablet itself also contains Nvidia's Tegra 3 processor. Pricing starts at $1299 for the Core i5 version with a 1TB hard drive in the base station and 32GB of EMMC solid-state storage in the tablet. 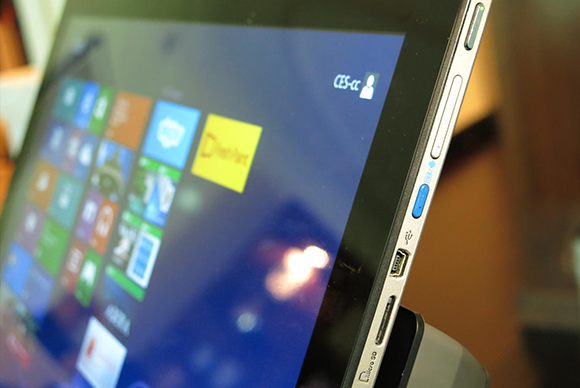 Asus plans to start shipping its PC-tablet combo sometime in the first quarter of 2013. 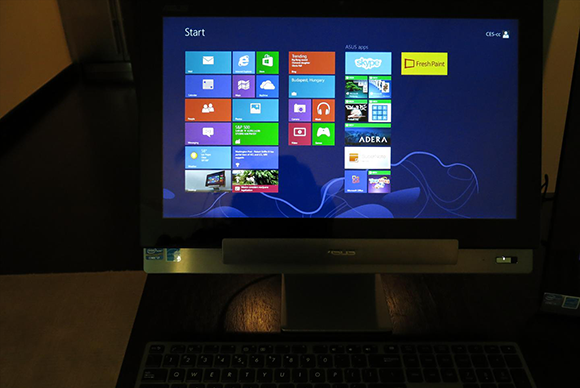 Press the blue button and this Windows 8 PC becomes a big Android tablet. When disconnected from the base, the tablet portion weighs 5.73 pounds—certainly not something you're going to carry about nonchalantly. But somehow, when I held it, the well-balanced unit felt neither unwieldy nor bulky. That might have been due in part to the fact that the display has a convenient pull-out handle that makes it easy to remove. It also has its own built-in stand if you prefer to prop it up directly on a table surface for giving a presentation or watching movies. The tablet portion could come in handy for playing tabletop games and other tabletop-style group apps yet to come. You can use the tablet on Windows 8 while it's connected wirelessly to a PC base station; however, when you exceed the Wi-Fi range (the range has yet to be finalized) it will switch to being an Android tablet. The base station packs a ton of connectivity, including four USB 3.0 ports. The two most interesting Asus laptops are both models we saw in 2012, but Asus never announced a release date for either of them—until now, anyway. The Asus Taichi 21, available in 11.6-inch and 13.3-inch models, has a double-sided LED-backlit IPS/FHD display. This effectively turns this Ultrabook into a tablet when the lid is closed. The two screens can be used independently of each, but still have access to the Taichi's hardware. Asus will release Intel Core i5 and i7 versions of the Taichi 21, starting at $1299, and it should be available shortly in North America. Meanwhile, the Transformer Book TX300CA, billed as a convertible Ultrabook, uses a similar approach to Asus' Vivo Tab RT and Transformer Infinity TF700. Pricing is still to be determined, but this model should be in the U.S. in the next couple of months. The display contains an Intel Core i7 processor with HD4000 graphics, 4GB of DDR3 dual channel RAM, Bluetooth 4.0, and USB 3.0. The 13-inch display packs a resolution of 1920 pixels by 1080 pixels.